space needle, a photo by Southworth Sailor on Flickr. Yesterday morning we picked up Sassa (Sayaka Maruyama) from the airport after her ten hour flight from Tokyo. Since we were in Seattle, we decided to take in some sights. The weather was great in the morning, but gradually deteriorated as the day wore on. 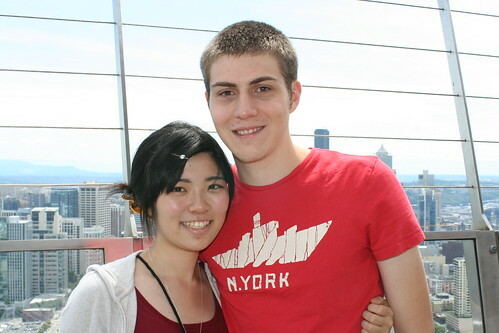 Calvin and Sassa went up the space needle. Then we visited gasworks park, University of Washington and Ballard Locks. We ended the day with dinner with Markus and Steph at Buca de Beppo. We look forward to a week with Sassa before Esther and I take off for Hawaii.